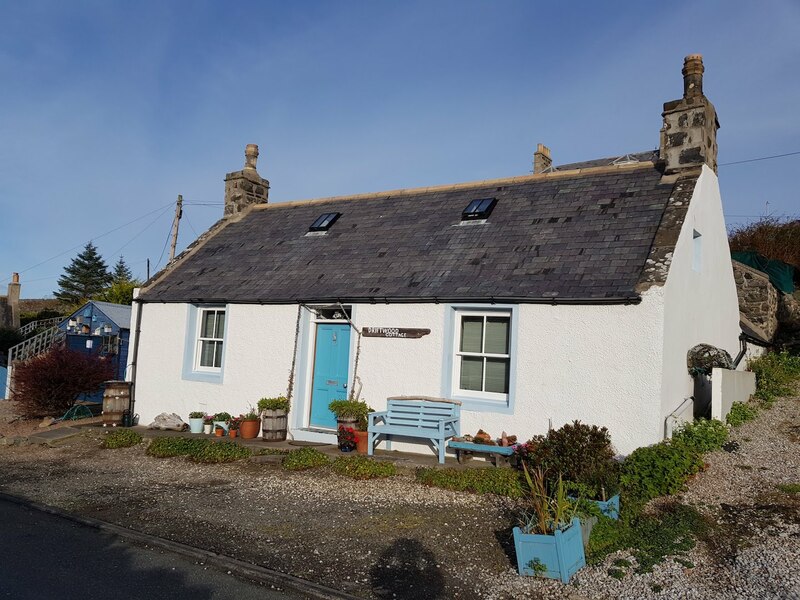 Driftwood Cottage is our latest venture and we welcomed our first guests at the end of March 2019. I am pleased to say that they liked it as much as we do – tho’ I was loath to move out at the end of our ‘test’ stay! Driftwood must be one of the prettiest cottages in Portsoy. It is often photographed, with it’s seaside theme and location all working in it’s favour! I will be uploading professional internal photos as soon as possible, but hope these work in progress ones will give you a feel of the place, and what we are trying to achieve! For me, apart from the location, the garden is one of the biggest attractions! There are not one, not two, but 3 terraces, as you climb the hill behind the cottage, with the view improving from each one! There is a barbeque area, plenty of seating, even a fish pond, and at the top, a ‘sitooterie’ (a summer house! ), where you can sit out, enjoy your G&T (or cup of tea!) and look out over the higgledy piggledy roof tops of the historic conservation area and beyond that, out to sea. The cottage has a king size double bedroom, shower room, lounge and kitchen, all on the ground floor, with a twin room and children’s play area up some fairly narrow and steep stairs, so is suitable either for couples of those with young families. Of course, like all our cottages, we have good WiFi and your four legged friends are very welcome. 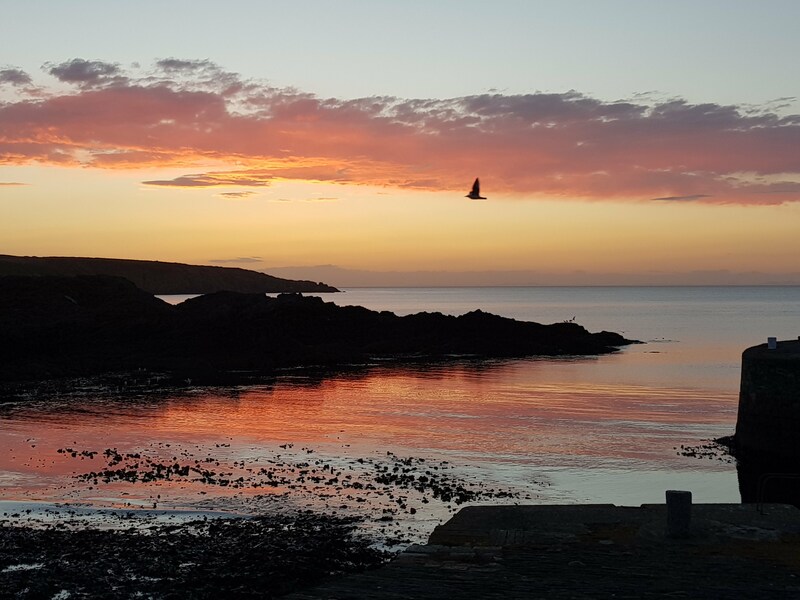 There are some fantastic walks round Portsoy, whether you walk westwards, past the old swimming pool carved out amongst the rocks, along the rugged coastline towards Sandend (pronounced ‘Sanine’) or further along to Findlater Castle, Sunnyside Beach and Cullen, or eastwards along the Coastguard’s path. There is the Shore Inn between the cottage and the harbours… and of course the award winning Portsoy Ice Cream shop. The Banffshire coast is one of the world’s outstanding coastlines, says the National Geographic. Natural beauty combines with plentiful wildlife – there are dolphins, seals, puffins and other seabirds in abundance, if you are lucky enough to see them. Fishing villages all along the coast perch on clifftops, or crouch precariously at the water’s edge, with the oldest houses built gable-end on to the weather and the waves. In the summer, the light up here is special, days are near endless. Winter skies are dark and starry and – with a bit of luck – you might even see the Northern Lights! We hope you will visit Driftwood, our latest cottage, and discover this often overlooked corner of the North East of Scotland for yourselves! Driftwood has an unashamedly seaside feel! Four people can easily feel at home here. We can also provide a cot or an extra camp bed for those with young families. The enclosed garden means the cottage is also ideal for those with well behaved dogs. 2 two-seater reclining leather sofa’s, coffee table, flat screen TV with freeview and DVD player, gas stove. Fitted kitchen with oven, gas hob, microwave, dishwasher, fridge/freezer, coffee machine, table with 4 chairs, crockery, cutlery, glasses and cooking utensils, door to back garden. King Size double bed with luxury linen and all seasons duvet, bedside tables with lamps, chest of drawers, full length mirror, wardrobe, radio alarm clock. Walk in power shower, sink and toilet. Cupboard with washing machine, tumble drier, ironing board and iron, vacuum cleaner. Low twin beds with bedside tables and lamps, radio alarm clock, chest of drawers. Bean bags, second tv and video, chest of drawers and toy chest! The cottage is WIFI enabled, and has a phone which can receive incoming calls. Prices range from £350 per week in the off peak winter months to £650 per week in the high summer. There is a supplement of £10 per dog, should you wish to bring one (or two! ), but we do ask that they are kept out of the bedrooms and not allowed on the furniture. The price includes all linen, towels, heating, electricity and a welcome pack with the basic necessities for that first cooked breakfast.